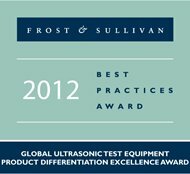 LONDON - Aug. 16, 2012 - Based on its recent research on the ultrasonic test equipment market, Frost & Sullivan presents Sonotron NDT with the 2012 Global Frost & Sullivan Award for Product Differentiation Excellence. In a concentrated market dominated by standardized products with minimum difference in functionality between competitor offerings, Sonotron NDT has displayed true product differentiation excellence. "Recognized in the industry as a truly customer-centric company, Sonotron NDT’s mission statement is centred on providing unmatched value-add to its customers," said Frost & Sullivan Research Analyst Nikhil Jain. "With best-in-breed products in terms of signal-to-noise ratio, and simplicity in operation and results interpretation, the company is a true leader in addressing customer needs." The company’s ISONIC utPod has been labelled as the ‘Swiss Army Knife’ of ultrasonic testing. The device combines the functionality of a flaw detector, A-scan thickness gauge, corrosion gauge, and a comprehensive data logger into one powerful, high performance instrument. "Launched in March 2011, the ISONIC utPod has gained rapid acceptance in the ultrasonic test equipment market," observed Jain. "Multi-functionality coupled with miniature dimensions and lightweight make the ISONIC utPod truly an ultra-portable piece of ultrasonic test equipment." As just a 400-gram unit, the ISONIC utPod is the smallest portable ultrasonic test equipment in the market. It possesses a USB interface and is the first plug-&-playable ultrasonic testing device. Freely distributed PC application software, downloadable from company’s website, enables remote operation of the instrument, data exchange and automatic creating of the inspection reports in popular MS Word ® / MS Excel ® / PDF formats. Additionally, the ISONIC utPod, like all other Sonotron NDT portable instruments, delivers an intuitive user interface on a high definition touch screen, augmenting the product’s ease-of-use. The ISONIC utPod comes in an IP 67 rugged plastic case, enabling the reliable operation of the product in the harshest of conditions common in on-site applications. As in all other products of Sonotron NDT ISONIC utPod also brings superior ultrasonic pulsing and receiving performance through digitally controlled analogue electronics. Such digital architecture allows continued improvement of the instruments already in operation by equipping it with additional functions and features required for NDT practice – Sonotron NDT provides lifetime free of charge software and firmware upgrade for every ISONIC utPod and all other instruments through downloading latest upgrade files from company’s web site followed by fulfillment of simple automatic upgrade procedure. An important aspect of Sonotron NDT’s customer-driven approach to product development is customization. For instance, the ISONIC utPod can be purchased with optional adapters called Goose Neck and Arm Fixture. The Goose Neck adapter allows positioning of the instrument on any surface to optimize viewing angle. This also leaves both hands free, giving greater flexibility to the operator to manipulate probes. Sonotron NDT’s portable phased array ultrasonic flaw detectors, the ISONIC 2009 and ISONIC 2010, too are extremely useful for advanced ultrasonic examinations. These instruments are based on Sonotron NDT’s pioneering true-to-geometry-imaging (TTGI) technology, which combined with phased array modality, enables representing the actual coverage of objects with simple and complex geometries and providing live 2D and 3D imaging of defects un their actual positions in real time whilst scanning. The most significant advantage of TTGI technology is simplification in the interpretation of ultrasonic phased array inspection results. Hence, non-UT professionals, such as welding, material, and mechanical engineers, manufacturing and maintenance staff can understand the implications of the results that in turn shortens the "inspection– finding imperfection – repair" cycle extremely. 2.4 kg ISONIC 2010 carrying 32-channel fully parallel architecture phased array electronics and one or two independent conventional channels, position encoder port, ability of performing TTGI technology based phased array, TOFD and other inspections with 100% raw data recording is recognized as smartest, lightest and smallest phased array ultrasonic flaw detector. In recognition of the unique value proposition Sonotron NDT offers to customers, such as ease-of-use, competitive price, and enhanced functionality, Frost and Sullivan is proud to present the company with the 2012 Global Frost & Sullivan Award for Product Differentiation Excellence in ultrasonic test equipment. Headquartered in Israel, Sonotron NDT was founded in 1993 and has a strong global presence. It has consistently delivered top-of-the-line products used for multiple applications across a wide range of industries including aerospace, oil, gas & petrochemical, power generation, military and nuclear among others. Sonotron NDT consistently expands its product portfolio demonstrating excellent capabilities to respond to market needs, striving to offer the best solution at the right price and in a timely manner. Company’s product line has become synonymous with reliability and great value for money representing full range of ultrasonic NDT equipment from simplest ultra-portable flaw detector and thickness gauge to multi-channel platforms for high speed automatic inspection and all modalities – conventional, TOFD, phased array, guided waves, etc.